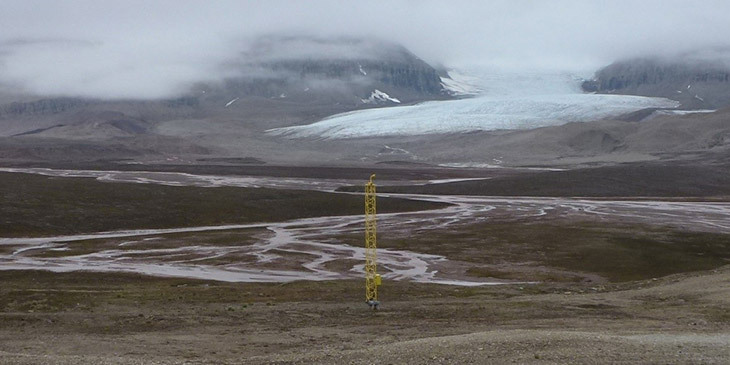 An international team led by Japanese scientists has generated significant findings that highlight the impact of high-latitude dusts on the conversion of clouds' water droplets to ice – or glaciation – within low-level clouds in the Arctic region. These results contribute to a better understanding of factors at the land surface and how they affect cloud formations. The research findings also add to a better understanding of how climate is affected by clouds, which are increasingly considered to be among the most important -- yet complex -- regulators of the global climate. Depending on the conditions, clouds either enhance warming or help cool the climate by trapping heat or reflecting sunlight back into space, respectively. The study was published in Nature Geoscience on March 25, 2019 (London Time). The glacier Brøggerbreen and its surroundings in July 2016 which show the haracteristics of glacial outwash sediments obtained in Svalbard. Clouds play one of the most important roles in the atmospheric system. They are key players in maintaining the radiation balance of the Earth's atmosphere and are also involved in maintaining the Earth's energy equilibrium. They are made up of particles such as ice crystals and/or droplets that in turn mediate the atmosphere's radiation balance and the maintenance of the Earth's energy equilibrium. When chilled below 0°C, water molecules start forming ice crystals wherever there are minerals or other solids suspended in the water-what are known as nucleation sites. Completely pure water that has no nucleation sites can be chilled well below the usual freezing point and yet remain a liquid-a process called supercooling. Clouds can also be affected by dust particles as they serve as ice nucleating particles (INPs) and cloud condensation nuclei (CCN) allowing ice and liquid droplet formation. In particular, mixed-phase clouds that are made up of water and ice are especially sensitive to dust particles whose source is yet to be fully elucidated. 1 National Institute of Polar Research, Japan. 2 Department of Polar Science, School of Multidisciplinary Sciences, SOKENDAI (The Graduate University for Advanced Studies), Japan. 3 Atmospheric Environment and Applied Meteorology Research Department, Meteorological Research Institute, Japan. 4 Department of Atmospheric Science, Colorado State University, USA. 5 Department of Earth and Atmospheric Sciences, Cornell University, USA. 6 Department of Earth and Planetary Science, Graduate School of Science, University of Tokyo, Japan. 7 Institute for Space-Earth Environmental Research, Nagoya University, Japan. 8 Institute for Advanced Research, Nagoya University, Japan. Publication date: March 25, 2019 (London Time).